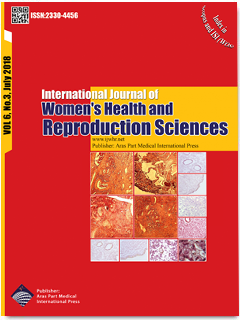 Materials and Methods: In a prospective cohort study, 160 women who referred to infertility center of Moheb-Yas hospital for IVF between March 2015 and March 2016 were enrolled. A long ovarian stimulation protocol was administered using a gonadotropin-releasing hormone agonist (GnRH). Anti-Mullerian hormone (AMH), progesterone, estradiol, and endometrial thickness were measured. Two expert embryologists categorized blastocysts as good or poor. Pregnancy was judged by serum human chorionic gonadotropin measurement 14–15 days after embryo transfer. < Results: Mean age of the cases was 32 years and mean body mass index (BMI) was 20 kg/m2. Clinical pregnancy rate was 20.6%. A significant relationship was found between IVF success and AMH, the number of FSH injections, endometrial thickness, grade of the embryos, and the number of embryos produced. Logistic regression analysis showed that only AMH > 0.6 was an independent predictor of IVF success (odds ratio [OR] = 6.22, CI [2.4-16.2]). Further analysis showed a significant relationship between AMH level and IVF success in women ≤35.